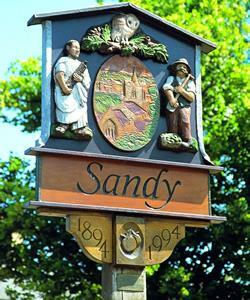 Sandy Jubilee Walks - Sandy Town Walk at SandyWalking RouteThis route passes a number of interesting buildings in the town and includes a varied landscape of water meadows, woods and hills. Sandy is at the junction of the A1 and A603. From Bedford, take the A603. Car parking is available in the town centre and the railway station. This circular walk starts at the Tourist Information Centre in Sandy, near the town centre car park. This route passes a number of interesting buildings in the town and includes a varied landscape of water meadows, woods and hills.